A flying visit to Norwich today to visit relatives and for some shopping. With the weather much cooler and windier than of late, it wasn't the place to hang around for long period of time. In between the shop visits, I caught three buses plying their trade in St Stephen's Street. The first vehicle photographed was that of a Sanders Coaches Volvo B9TL with East Lancs Olympus bodywork. The 102 seater OU05KKB had just completed the 12:28 X44 service from Sheringham. 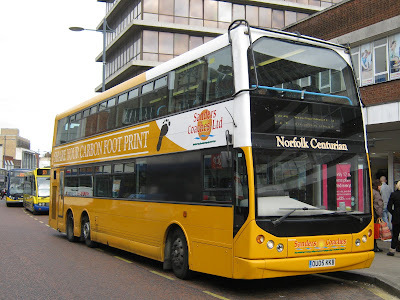 The bus has fleet number 103 and has the name Norfolk Centurian. In the opposite direction I caught First Eastern Counties Optare Solo 53122 (EO02NFD) working the 27A to Hercules Road via Aylsham Road. The final photo (below) is of a Norfolk Green Optare Tempo. No 111 (YJ56ATX) is seen arriving in St Stephen's Street with the 13:30 X29 service from Fakenham. Coaches where she wore a special livery for the 775 service between Shrewsbury and Llanidloes. A picture of her working for Tanat Valley can be seen by clicking here. Following the brief shopping expedition, it wasn't too long before we were back in the car for the warm journey home! During the last couple of days I have been spending some time in the North Warwickshire town of Tamworth visiting the in-laws. Tamworth is one of those towns which grew in the 1960/70s following Birmingham's slum clearance programme and the area continues to benefit from additional population. Arriva's operating centre is its Aldergate Garage; although I believe an out of town base has been considered by the company for some time. 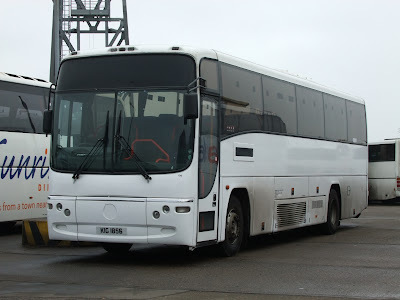 A fleet of forty vehicles is maintained there including 21 Volvo B6BLEs, 2 Scania L113CRLs, 9 Scania OmniLinks and 8 Volvo B9TL double-deckers. Around the corner from Aldergate is Corporation Street, one of the two main pick up points for buses in the town; the other is in Victoria Road. Apart from town services, there are also routes to Nuneaton, Kingsbury, Birmingham, Birmingham International Airport and Lichfield. The only other operator in evidence was Heartlands Bus which is also based in the town on Lichfield Road Industrial Estate. However, I also visited Tamworth town centre on Tuesday - market day. But I did manage to grab a picture of Heartlands Buses recent arrival on my mobile phone camera. 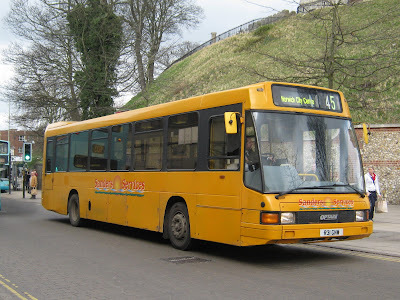 It was Optare Alero W9SMS or 173 in the fleet. Tamworth has a good deal of history as well, including an impressive town centre church, St Editha's, and also an equally impressive castle. Regular contributor Stephen Gowler from Oulton Broad observed fourteen vehicles at Beach Coach Station around lunchtime today. They include two from Chorley based Alfa Travel; both Volvo B12Bs 48 (PN08KXK) and 59 (YNE10EOK) with the latter being shown right. B10M 8850WU, Gee Vee Travel's Bova R1GVT and David Urquhart's Mercedes S21ETC. 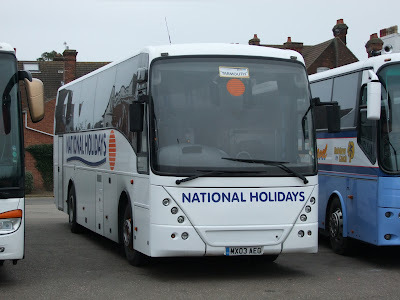 Shearings and National Holidays maintained a constant presence with regular visitor BF10VCT (223) from the former and NH05GDH of the latter being on site. My thanks to Steve for his help with this report - including pictures of all the vehicles seen there earlier today. Yesterday saw the Department for Transport announce the successful bids under round three of the Government's Green Bus Fund. The aim of the fund is to reduce fuel emission levels by encouraging bus operators and local councils to use more eco-friendly vehicles. Of the £3 million to be spent in the East of England, an offer of £624,000 has been secured by Anglian Bus of Beccles for 13 new gas powered single deck buses for use in Suffolk and Norfolk. It is understood that the vehicles will be MAN EcoCity buses similar to the vehicle loaned by Anglian towards the end of last year. Regular correspondent Stephen Gowler of Oulton Broad sent in his observations of Great Yarmouth's Beach Coach Station at noon today. As you may be aware Wednesday is Market Day and he logged eleven vehicles at the Coach Station. Also in attendance were two Norfolk County Council (Norse) coaches. The Shearings Group was represented by two vehicles from each of Shearings Holidays and National Holidays. A stroll along Great Yarmouth's seafront this afternoon in the lovely sunshine. After crossing Marine Parade into the shade, a Shearings Volvo B12M passed me in the opposite direction. 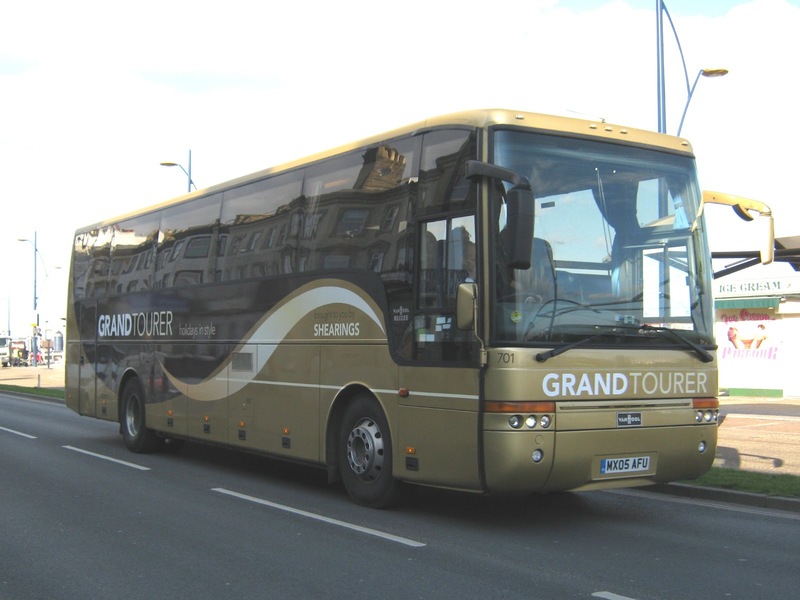 It was 701 (MX05AFU) complete with Van Hool bodywork in Grand Tourer livery. Regular blog supporter Syd Eade is once again able to provide a copy of the First Group Fleetlist absolutely FREE! to East Norfolk Bus Blog readers. 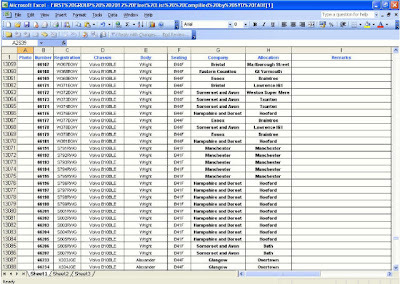 Syd is offering a spreadsheet listing every bus in the First Group which has held a five figure fleet number. The list includes the vehicle's present operator plus its current allocation if still in service. A sample page is shown above - just click on the image and a larger version will be displayed in your browser. An alphabetical listing of registrations is also provided allowing photographers to easily identify fleet numbers of the vehicles seen. This is obviously a very large task to keep the information up to date but Syd is prepared to provide a copy to you for nothing. A recent First fleetlist publication went on sale (already out of date!) retailing at £18! 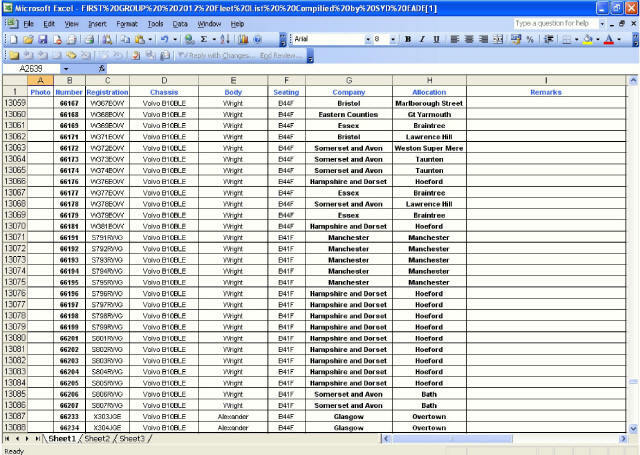 The information supplied is dated March 2012 so, therefore, is completely up to date. To receive a copy (there's no catch!) just email Syd at pakefieldcranks@gmail.com and he will provide you with a copy by return. My appreciation to Syd for making this offer exclusively available to East Norfolk Bus Blog readers. 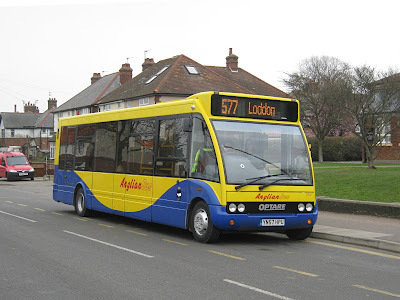 As you may have seen elsewhere, Anglian's operation of the 577 route between Great Yarmouth and Loddon (Chedgrave) via Haddiscoe is to cease at the end of March. 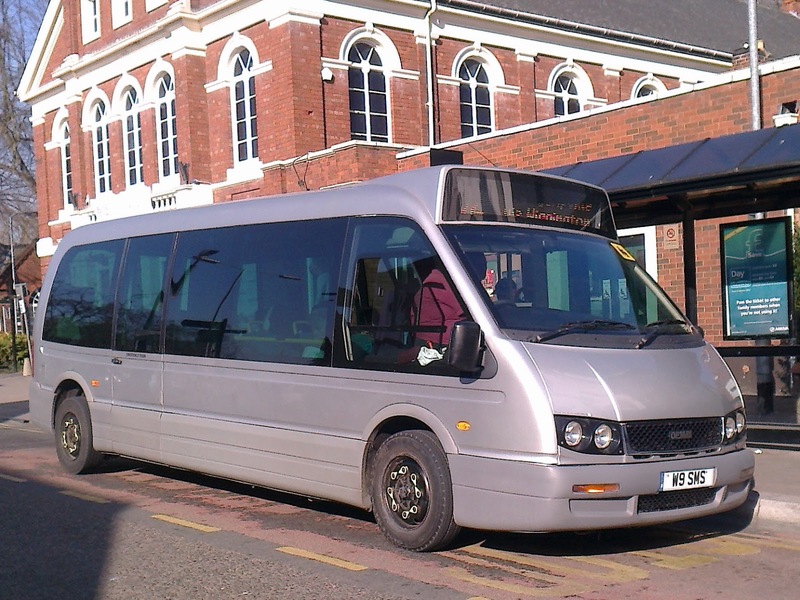 The weekday service, comprising one bus each way daily, includes a circuitous route providing a connection to the James Paget Hospital and the East Norfolk Sixth Form College in Gorleston. The photo shows Optare Solo 313 (YN57HPU) on 13:30 from Market Gates picking up students outside the College this afternoon. 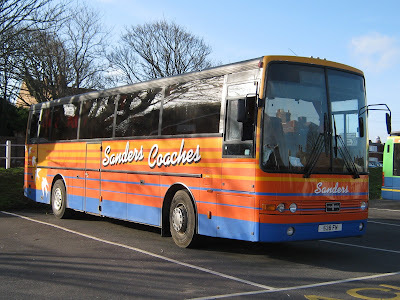 Following an earlier blog post relating to the appearance of six Shearings Group coaches at the Beach Coach Station, I decided to make a visit late this afternoon to see if I could witness their return following their outings today. However, I only saw the arrival of four of them - Shearings' 223 (BF10VCT), 321 (BK11CPX) and 804 (MX06AKU) plus the solitary National Holidays NH09PRH. It is not known whether the other two of the National Holidays' fleet had returned home or were late back from their day trips. Anyway it provides me with an opportunity to upload pictures of the four that were there! In addition to the influx of the Shearings Group vehicles yesterday, regular contributor Stephen Gowler reports the presence of a Welsh - based vehicle at Great Yarmouth's Beach Coach Station earlier today. It was this Van Hool T916 with the registration WA10CFP which is owned by Edwards of Pontypridd. 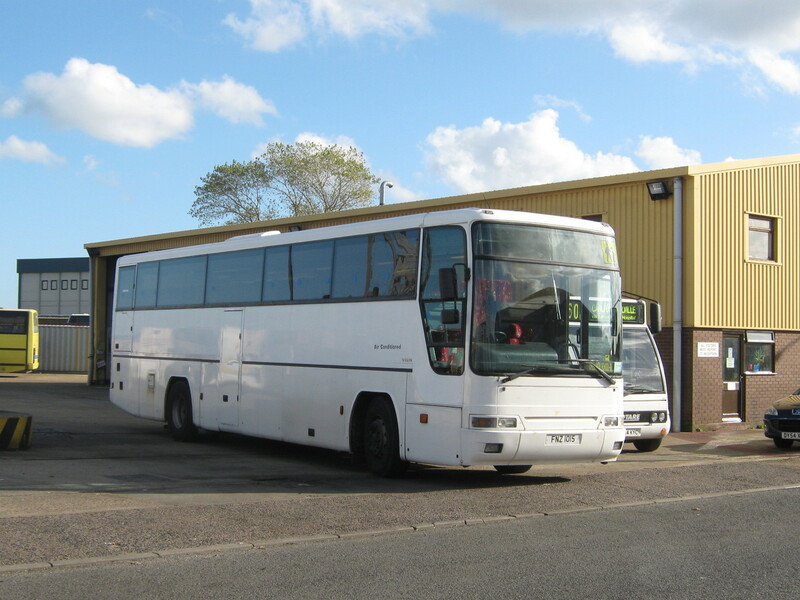 She is reported as being new to MM Ford of Aberystwyth in June 2010. My thanks to Stephen for the report and photograph. 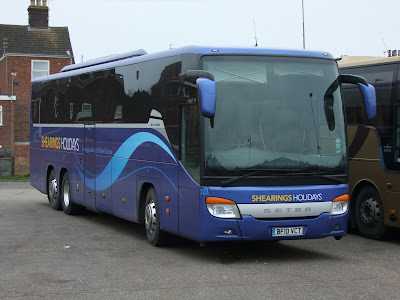 Late this afternoon Grahame Bessey visited Great Yarmouth's Beach Coach Station and observed no less than six Shearings Group coaches; split evenly between National Holidays and Shearings Holidays. The Shearings Holidays vehicles were Setra S416GT-HD 223 (BF10VCT), 321 (BK11CPX) and Volvo B12M 804 (MX06AKU). The latter in Grand Tourer livery. The National Holiday examples were Setra NH09PRH and Volvo B12M's MX03AEG and NH06KEH. 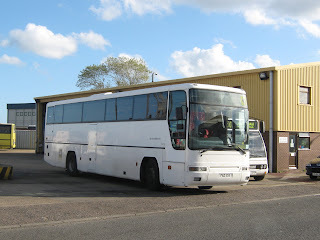 My thanks to Grahame for the information and photos of all six vehicles. I passed Beach Coach Station at 2.15 this afternoon and saw absolutely nothing! * 102 County Hall to Harford Park & Ride in Norwich. Ambassador will commence their operation from the 2nd of April. 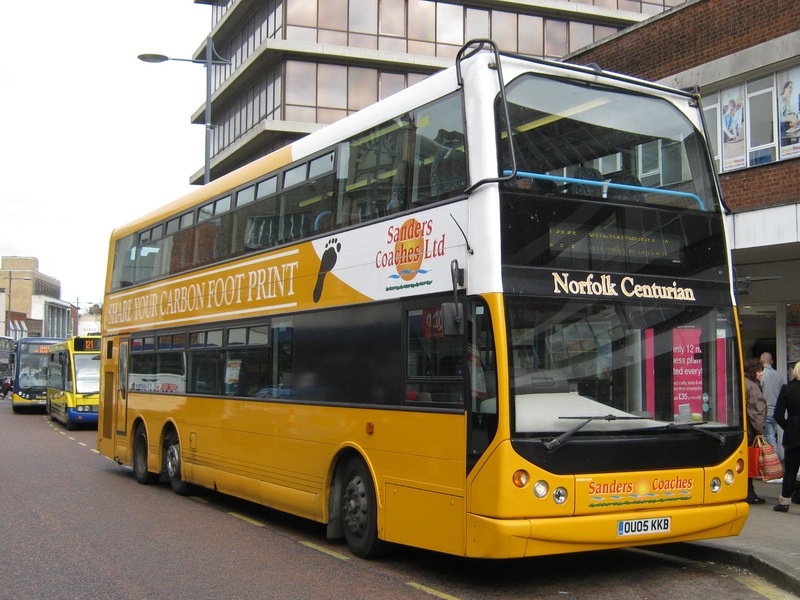 A day in Norwich yesterday with a trip into the city using one of Norse's Tridents from the Postwick Park and Ride. National Express Scania/Irizar SH58 (YN55NDZ) was there to greet us having arrived on the 06:50 727 service from Gatwick Airport. Despite the long journey via Stansted Airport it arrived at the Bus station only 5 minutes down at 12:15. Journey's end is just 'down the road' at the University of East Anglia. After a spot of lunch (and window shopping!) I headed to Castle Meadow to view the activity there. Konectbus Optare Versa 300 (MX08UZT) passed by almost immediately on the 13:10 service 5 to Costessey Queen's Hills. For those that are not aware, Konectbus now forms part of the large Go Ahead group. Continuing Friday's Sanders' theme, their DAF/Optare Delta 503 (R31GNW) ran through Castle Meadow with the Saturday only 12:20 from Holt. 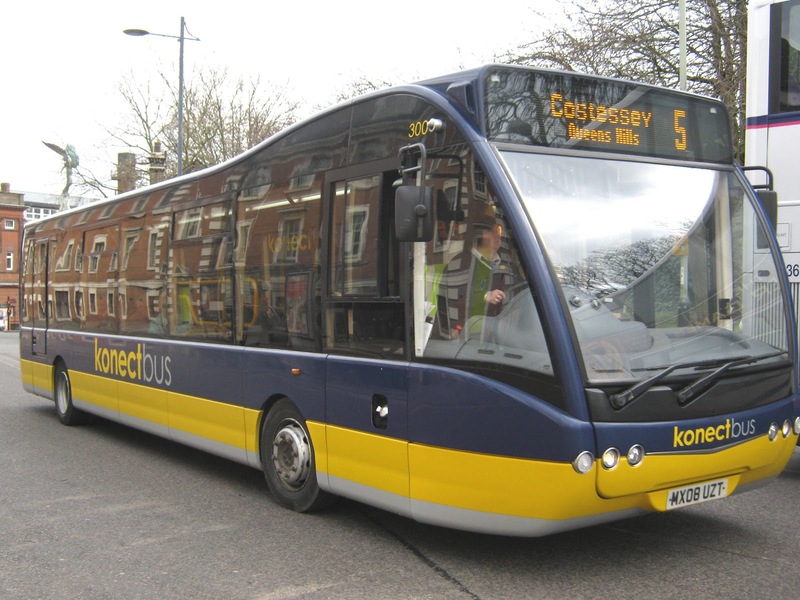 Dereham-based Konectbus received five new Alexander Dennis Enviro 400 bodied Dennis Trident IIs towards the end of 2011. The vehicles are especially branded for the 8 Toftwood - Dereham - Norwich FAST service and were introduced from the beginning of this year. Saturday was the first opportunity I have had to photograph any of them and the last of the five (609 (SN61CZZ)) duly obliged. and is seen leaving Castle Meadow. My last photo is from the top of one of Norse's Tridents leaving Norwich's Surrey Street Bus Station for the return journey to the Postwick Park and Ride site. I was lucky in being able to grab the front seat and the view shows the variety of company vehicles present. The left hand line up includes a Norfolk Green Tempo (103 YJ57YCC), an Anglianbus vehicle, with two from Konectbus forming the front of the two lines. The end of the middle line (closest to the camera) is taken by First's Scania 65674 (SN51UYH), a former First Essex vehicle. Also discernible on the right hand side is a Norse Trident with a National Express vehicle tucked in behind. Friday was the first day of the three day North Norfolk Railway Steam Gala and, following many photos taken at the Gala, the camera was putting in some overtime by taking some bus photos in Sheringham and Cromer too! 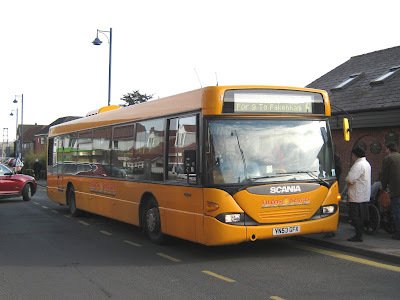 The first is of a Sanders Scania OmniCity 303 (YN53GFX) taking on passengers outside Sheringham's Tourist Information Centre on Station Approach. New to Menzies of Heathrow in October 2003, it is one of many transferred to local bus independents. 303 was being employed on the 14:09 North Walsham to Holt Service 4. A couple of minutes later, on the opposite side of the road (outside the North Norfolk Railway Station) another Sanders vehicle was loading. This time it was DAF/Wright Cadet 203 YJ03PKY performing on the 14:31 Holt to North Walsham service 5. YK03PKY was new to Pullman of Swansea in South Wales. Returning to our previous location, on the opposite side of the road, Norfolk Green Solo 'Admiral Lord Nelson' arrived in Coasthopper colours. 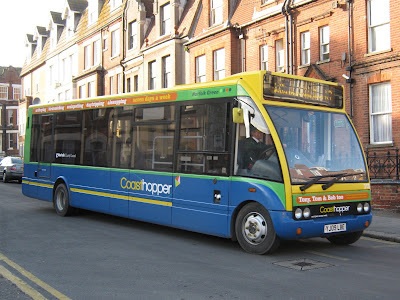 In the guise of 311 (YJ09LBA) the Solo was operating the 14:45 Cromer to Wells-next-the-Sea Coasthopper ch3 route. around the coast to Cromer. My first port of call was Cadogan Road coach and car park. Here I found two local vehicles parked up. 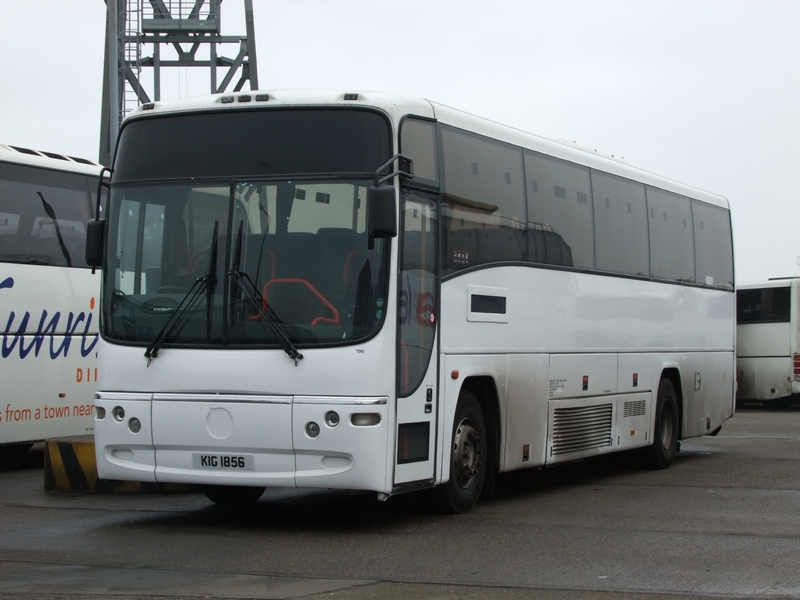 One of them was Sanders DAF/Van Hool 538FN on contract duty awaiting the return of its passengers. 538FN had previously been registered V215EGV and 6399PP. The other vehicle was Norfolk Green Solo 313 (YJ09LBE) laying over prior to working its next duty, the 15:45 ch3 Cromer to Wells-next-the-Sea. The photo (right) shows her subsequently arriving at the bus stop in Cadogan Road about to take up that working. three Coasthopper drivers when the service first started back in 1996. My final photo is that of another Sanders OmniCity, this time 308 (YN53GFA) is utilising the old Cadogan Road Bus station site on a North Walsham working. It was interesting to see the two independents dominating the bus scene in the two North Norfolk towns with not a First bus to be seen anywhere! 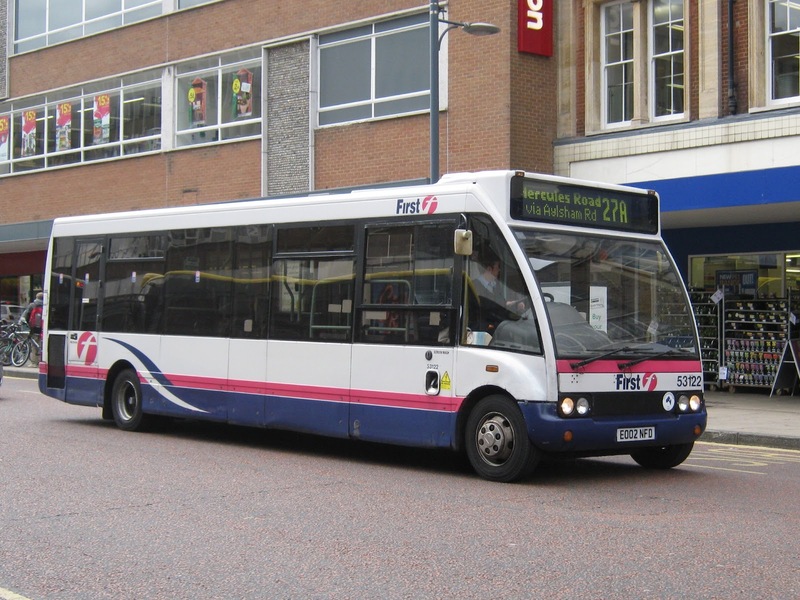 The final pair of First's Volvo B7/Presidents are transferring from Lowestoft to Great Yarmouth; thereby removing them from X2 duties for which they have proved unreliable performers. 32211 (LT52WTU) was exchanged with B7/Alexander 30889 (W744DWX) yesterday morning with the latter operating the 1008 X2 from Lowestoft to Norwich. 30886 (W741DWX) is being be exchanged for 32210 (LT52WTR). These transfers would have left Caister Road with just one Alexander/B7 so, accordingly, 30887 (W742DWX) has joined her sisters in Lowestoft. Volvo Olympian 34158 (P658UFB) has gone the other way in exchange. My thanks to Syd Eade for the above information. 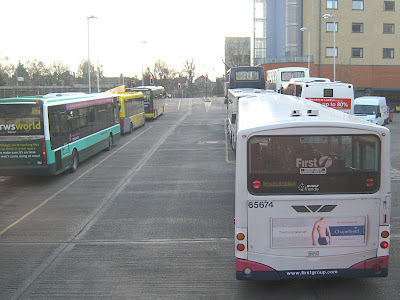 The Traffic Commissioner for the Eastern Traffic Area published details of notices and procedures on 22nd February 2012 regarding local bus services and operators. The following affect services in the East Norfolk area. Alterations by Anglian Bus reported earlier have been omitted here. 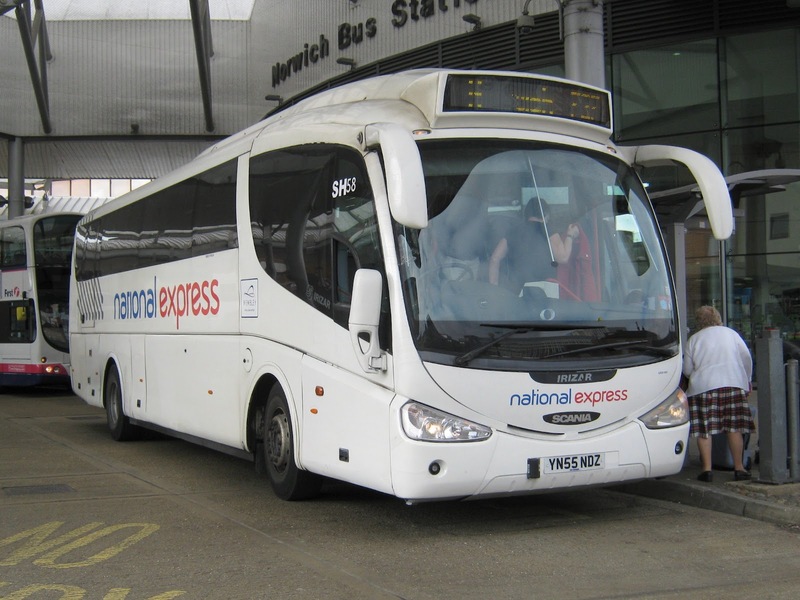 Operating between LOWESTOFT BUS STATION and PETERBOROUGH RAIL STATION given service number X1 effective from 01-Apr-2012. To amend Stopping Places and Timetable. Operating between Great Yarmouth, Market Gates and Bradwell/Belton given service number 6/6B/7 effective from 01-Apr-2012. To amend Route and Timetable. 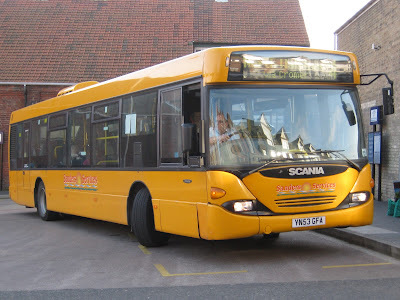 Operating between Hemsby and Cobholm given service number 586 effective from 02-Apr-2012. To amend Timetable. 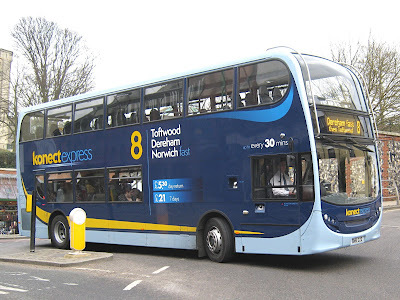 Operating between NORWICH and WROXHAM given service number 12B effective from 01-Apr-2012. This morning I received a newsletter from Anglian Bus providing details of bus route changes due to take place during April. Among the alterations are those affecting some Great Yarmouth services. From the 9th April the 581 will no longer serve Aldeby, Wheatacre or Burgh St Peter with its route continuing along the A143 road instead. 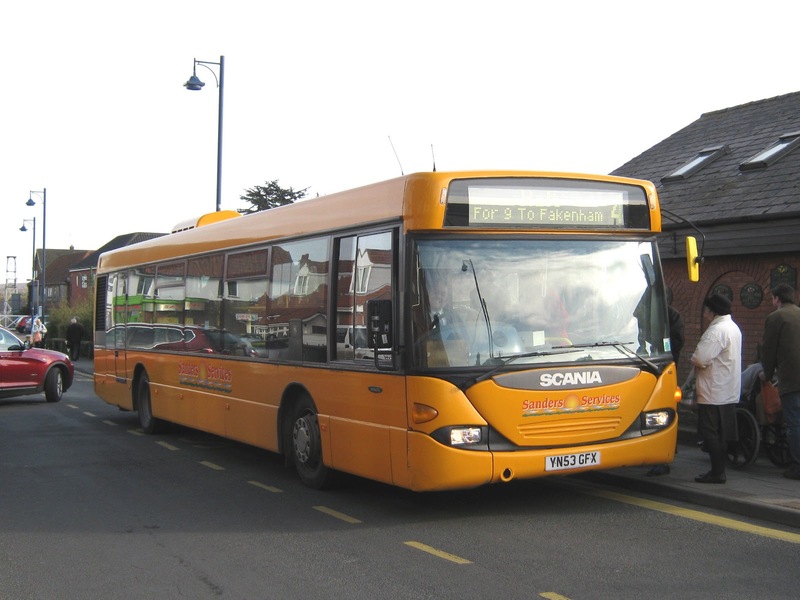 The three villages will be served by a new 581A Beccles to Great Yarmouth Southtown Road once daily weekday service. Also after the end of March the 577 Great Yarmouth - Haddiscoe - Loddon will cease to operate due to declining patronage and insufficient subsidy. Changes are also planned for the A47 Great Yarmouth - Norwich and the 601 Great Yarmouth - Lowestoft - Kessingland - Southwold routes but details have yet to be finalised. Also of interest is a new 603 service commencing on the 9th April from Carlton Coleville to Lowestoft via Secrets Corner, Lowestoft Road, Ribblesdale and Stradbroke Road. It commences from the East Anglia Transport Museum in Carlton Coleville and operates on a thirty minute frequency. Anglian will start to add the new timetables to their website during the week ending 18th March. Regular contributor Grahame Bessey dropped into local operator Ambassador Travel's premises this morning on Gapton Hall Industrial Estate. At the James Watt Close site he found Plaxton Paragon 152 (FN52HRG) carrying the new cherished registration of KIG1856. My thanks to Grahame for the information and photo.